Q. How do I use the CaltechDATA API to create records? First, you need to generate an access token. Log into CaltechDATA, and then click on your user menu (the person icon in the upper right hand corner). Then click "Applications". Click on the "+ New Token" button in the Personal access tokens section. Make up a name for your token and check all of the scope buttons. Your token will be shown on screen. Copy it down and store it somewhere secure. It functions just like an account password. You can create records using our python library caltechdata_api. You can install the library by downloading the source code of the latest release, extracting the file, and navigating to the caltechdata_api-x.x.x directory using the command line. Then type 'python setup.py install' to install the library. To use the library, you'll need to set the access token you just created. Type 'export TINDTOK=TOKEN', where TOKEN is replaced by your actual token - or use the token.bash script that is distributed with the library. Some scripts used for creating more complex data records are located in the caltechdata_migrate repository. 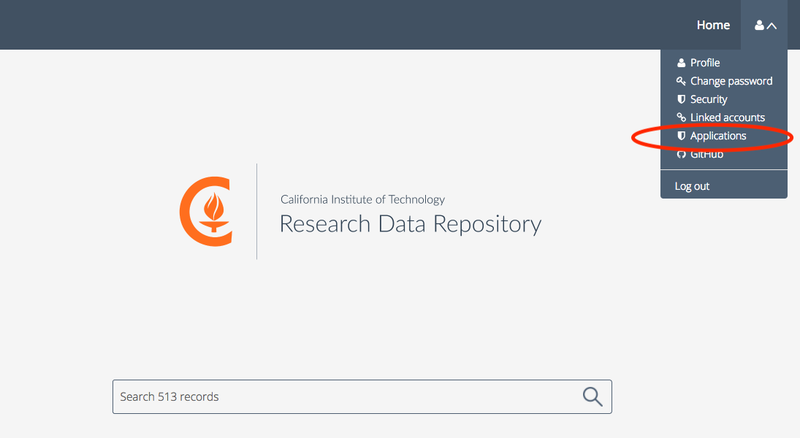 An example that published a mercurial repository to CaltechDATA is available at caltechdata_hg.